What a mess. 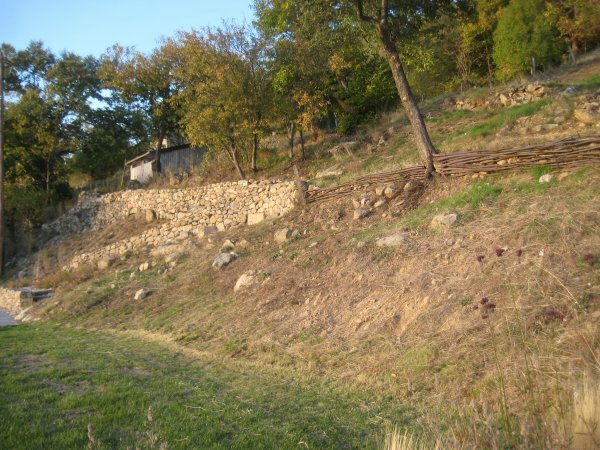 Here is a steep sloping bank of the farm in its natural state. 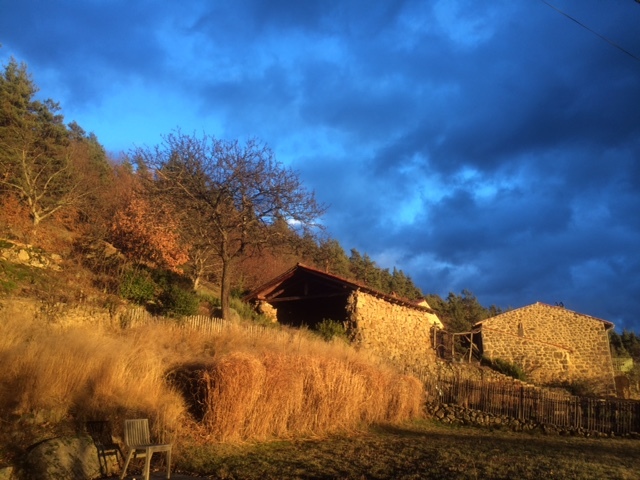 Rubble, poor soil, weeds, a rutted track leading down from the barn to the terrace; and nothing that pleases the eye. Using the barn as your guide you can see that this bank links what is now the pool garden lawn and the barn garden above. And it has been a head scratching exercise in how to landscape such an inhospitable site. Not only is the soil poor, it sits on granite rock. Every Spring the entire area would be covered in a rather pleasing vetch wildflower. But soon after the weeds would take over and I developed a knack of just averting my gaze. But we had to do something. So first up there were walls to build and steps to be made. 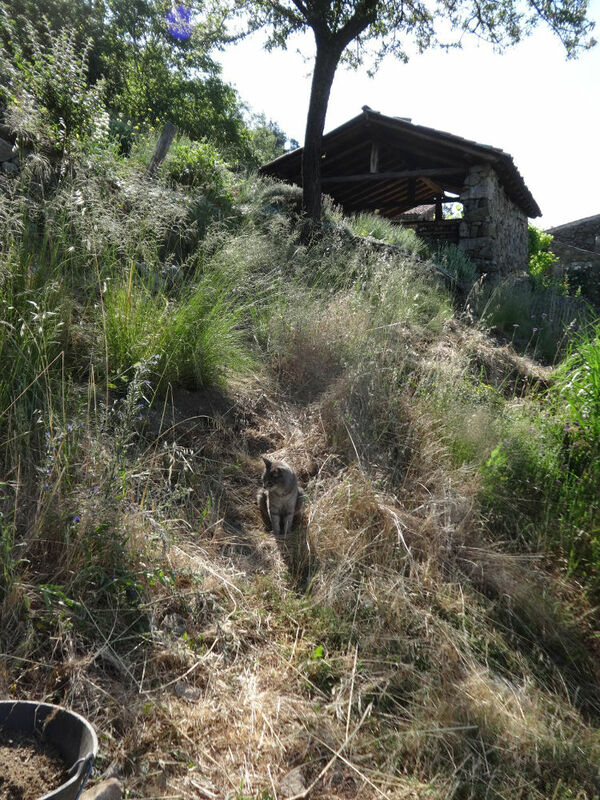 We use this path quite a lot when we leave the house, cross the courtyard, walk through the open barn, past the barn garden and down the steps to the pool. 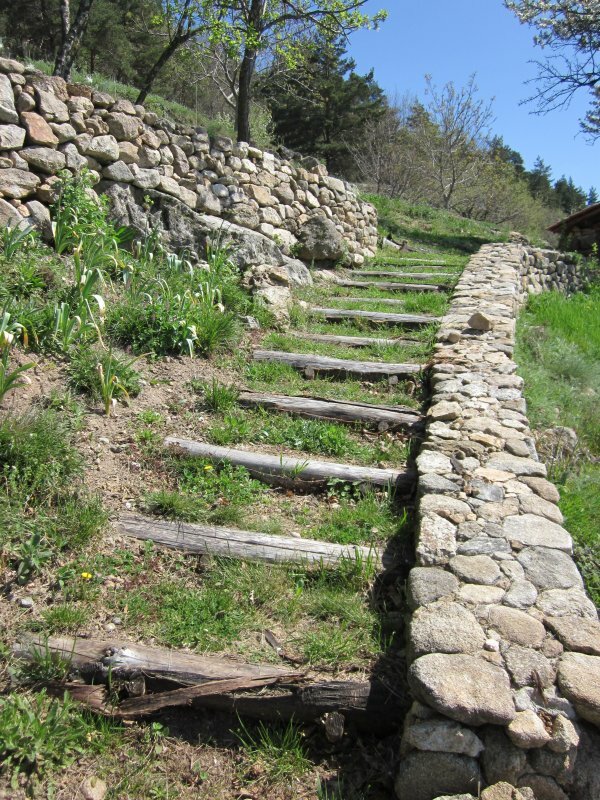 Nicolas had finished repairing the wall you see to the left – the one above the pool garden bank; and worked on simple steps down using the same stones. Mighty granite. A nice simple line. I must confess that I did rather leave the eye to appreciate the hard landscaping and not fuss too much about the rest of the bank. 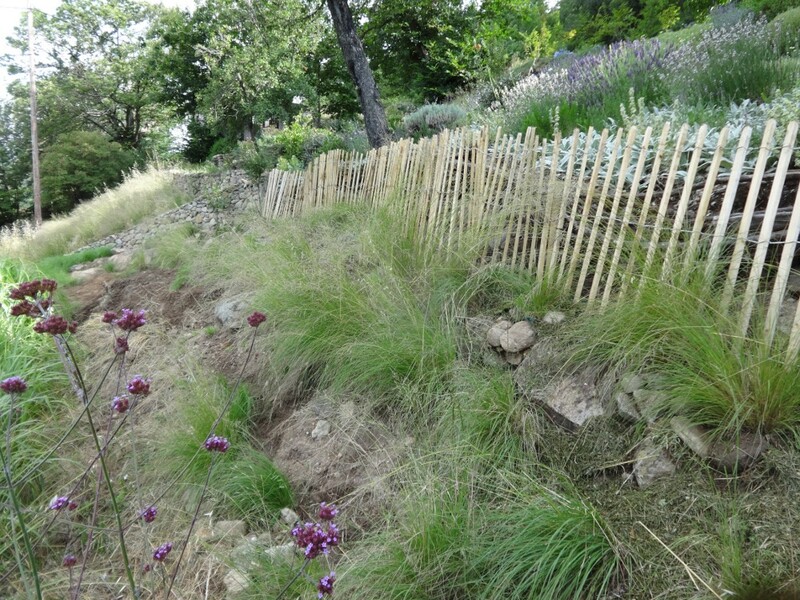 Some years we had a lovely annual grass that almost hid all the faults of the bank. 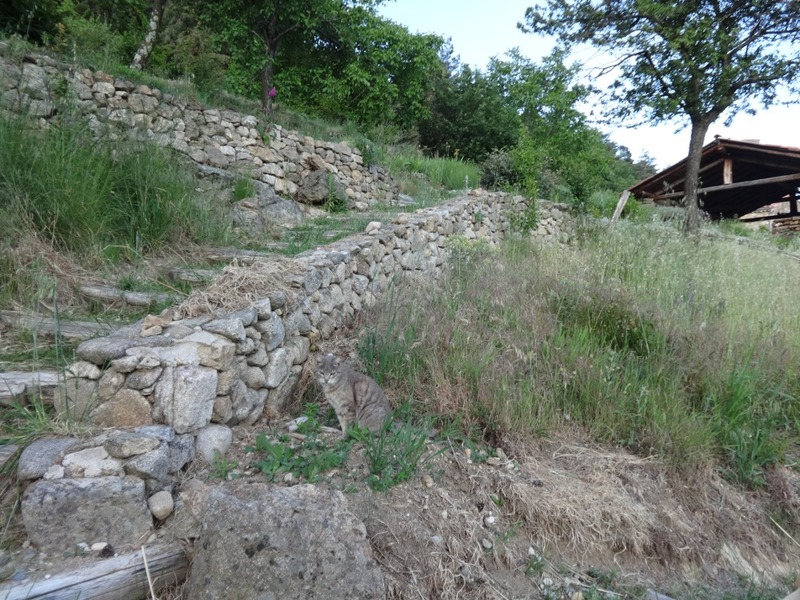 I ran out of funds to continue the stone wall all the way along the barn garden. It would have been attractive. But after almost a solid year of building, we did yearn to get on and not have rubble fields all over the farm. So a simple chestnut hurdle fence had to do the job. It sagged. But I just left the grasses to grow up and even put up with the farmer’s enemy black oat grass to hide the worst. In the early years I would get a rush of blood around July and remove all the annual weeds. But I never really thought of what ought to replace them. Then in 2013 I realised it had to be properly landscaped. So I made a start. 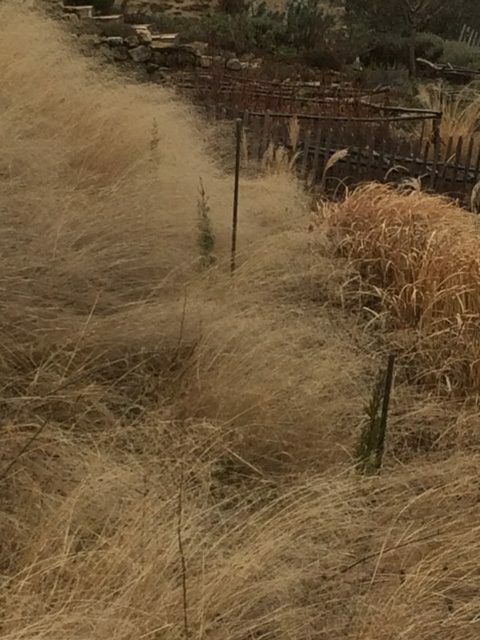 I harvested all the eragrostis seeds I could rip off the swaying plumes and sowed and sowed and sowed. There is a cat hiding somewhere in this jungle. He loved it. It was a perfect place to hide and leap out at me when I least expected it. 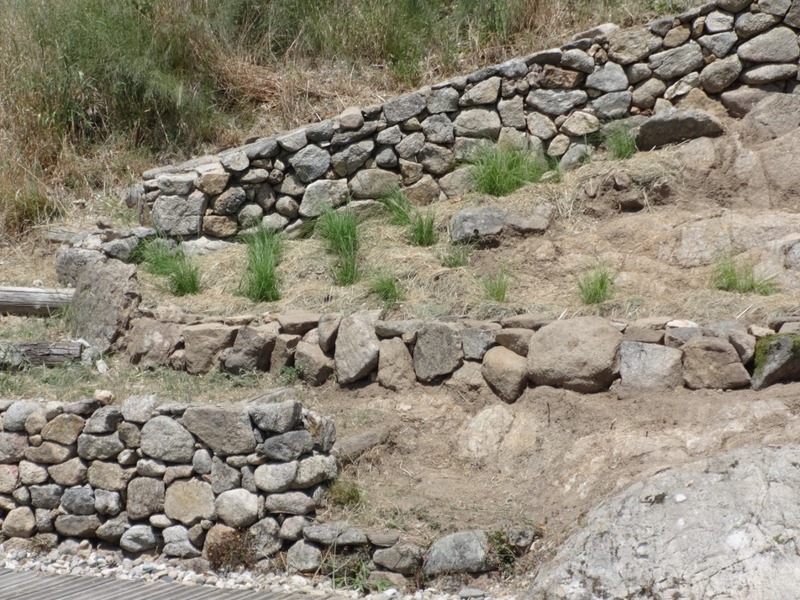 I made a few structural mini terraces of stones along this steep bank. And a path where I could step without tumbling onto the miscanthus hedge below. 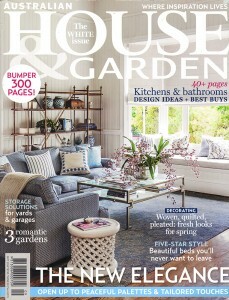 I’d best put a picture of the miscanthus hedge here. Otherwise you might be despairing by now. This really is a weedy confession. It actually belongs on the lawn and will no doubt appear in a later farm tour. But it really does hide most sins. 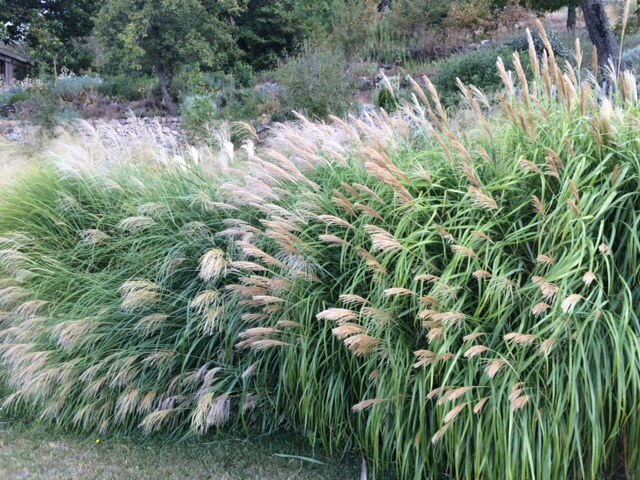 The miscanthus grow to almost six feet tall. 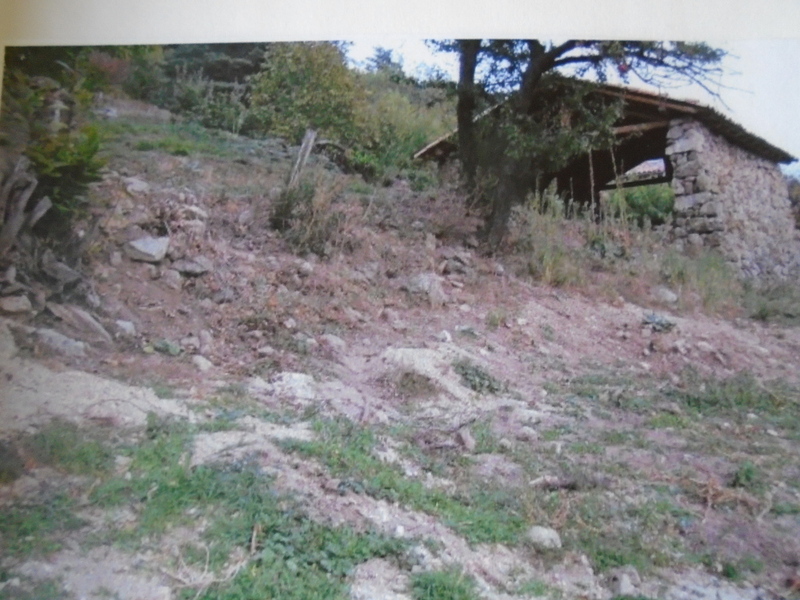 And were it not for the steep slope behind, I could have got away with not doing much to the bank. But the grasses get cut back every February, and there is always that pause before the grasses shoot up. 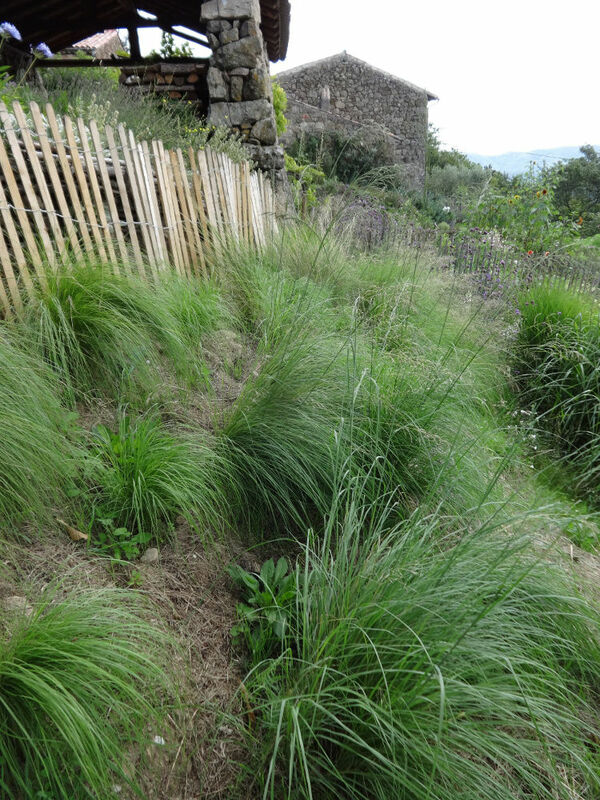 Every time I had a spare eragrostis curvula grass, I would transplant it to this bank. 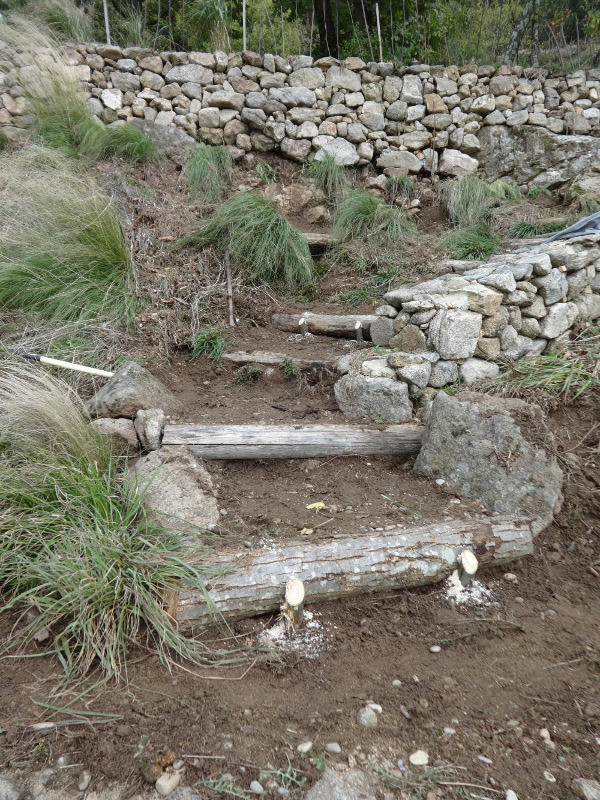 We had a pause when the flood came and washed away all the chestnut steps that leads down to the pool. Nicolas rebuilt them in an afternoon. And altered the shape at the bottom. It gave me the push to remove all the brambles and misplaced Pennisetum I had planted here and start again. But by spring in 2014 I had enough plants that I had grown from seed to really get going. But first. A wall or two. Just tiddlers. Ones you can tell I made myself. A bit wonky. A bit ‘rustic’. But I decided that there was just too much soil on this bank. Soil harbours bramble roots. So I dug out the excess and lobbed it behind the miscanthus. And dug and dug. I didn’t realise just how much unnecessary top soil was covering these gorgeous rocks. So a few weeks of archeology revealed enough to make a feature and I planted up. Hundreds, and I mean hundreds, of little grasses. I now wanted to have the entire bank uniform. 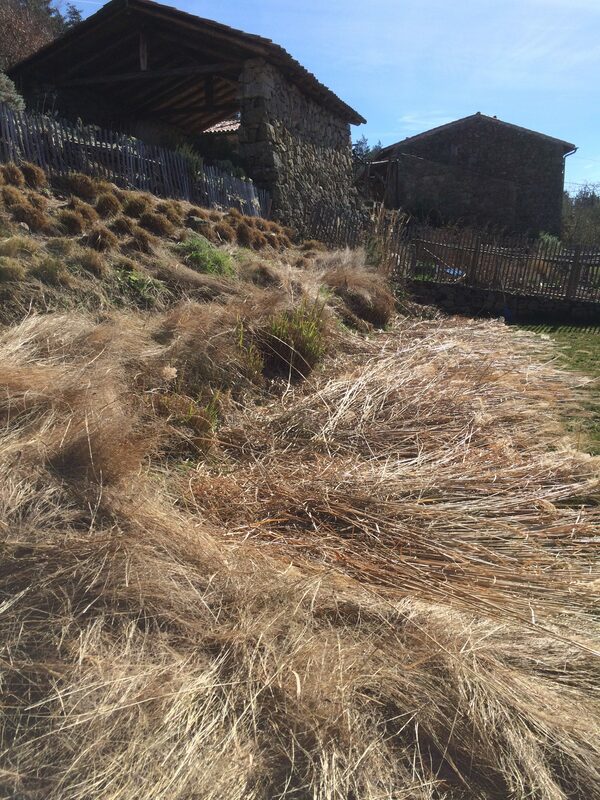 Billowing grasses to match the ones that had finally settled down and grown away on the other side of the steps. And the wet summer was just perfect for getting these beauties established. And I invested in 15 metres of the same chestnut palisade fencing as the ones in the potager just below and to the side. If I was going to the effort of clinging on to this steep slope and planting up, I might as well fix the sagging fence as well. I just hid it behind this new upright form. It was pretty much instant gardening. I have some verbena bonariensis flowers dotted throughout the bank. But they are about a foot taller than I would really like for the planting scheme. They tower a bit over the grasses right now; when the effect I was aiming for was mingling. But it’s early still in this landscaped bank. I need to mulch heavily between the grasses the keep down the weeds. 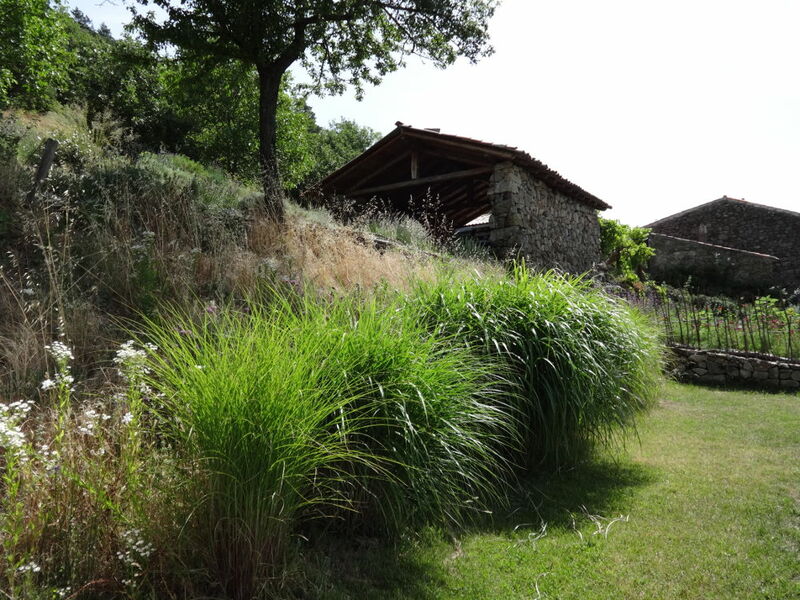 And when the grasses are really well established, I can then start to introduce a bit of colour and interest. For now I just get such a kick out of seeing the swaying mass of green. And I don’t even have to hide my gaze from a huge and important part of the garden. ‘A bit of colour and interest’? What dreams I had back in 2015. The hard drought years put paid to most of those too tall verbena plants. All I seem to have left are grasses. But haven’t they done well? Here is a little montage in case you are having a surfeit of the delights of eragrostis curvula. February is the month when I launch myself at all the grasses and cut them back. And I always marvel that these bleached white pale swaying grasses are actually alive under the soil. Well, this will be the month to panic. The huge drought and heat of 2017 may have killed a few. I won’t know until I cut and see. The miscanthus barely flowered which was worrying. They rely on the underground spring that feeds the base of this bank. So here’s hoping I don’t get any nasty surprises. And once the cutting is done I can get on with planting my Italian cypress trees on the bank. Something has to be done to break up this relentless rush of grass. But my, it is a photogenic grass.